To all who did receive him and believed in his name, he gave the right to become children of God–children born not of natural descent, nor of human decision or a husband’s will, but born of God. Furthermore and most importantly, with reference to the remainder of mankind (i.e. those who are not yet disciples), the canonical text states: ‘I have other sheep, which are not of this fold; I must bring them also; … so there shall be one flock, one shepherd, … to gather into One the children of God who are scattered abroad’ (Jn 10:16/11:52); and, ‘Go therefore and make disciples of all nations’ (Mt 28:19). 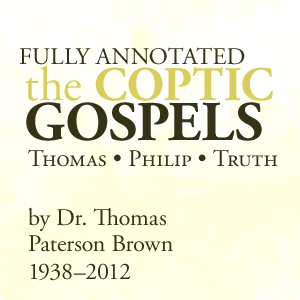 This most fundamental messianic doctrine may be summarized as follows: The person instructed by the Logos (Christ), who thus comes to know himself (Th 3, interlinear), thereby sees that he has in truth all along been an eternally begotten Son of God, born ‘from above’ (Greek ΑΝΩΘΕΝ, Jn 3:7-8+31). However, the vast multitudes of humankind are evidently unaware of being Children of the Most High, rather than children of local couples. Hence confusion and evil, and hence the need for evangelization (T.P. Brown, ‘God and the Good’). Adultery occurred first, then murder. And Cain was begotten in adultery, for he was the son of the serpent. Therefore he became a manslayer just like his other father (the serpent), and he killed his brother Abel. Yet every mating which has occurred between those who are dissimilar is adultery. Philip 46 is a logion which seems to genuinely illumine and clarify not only the OT concept of Original Sin, but also the notoriously difficult passage at Jn 8:44. Now, in whatever sense could it be said that Cain was not born of God, but of the serpent? Nyq: ‘fit together, fabricate, make artificially, forge’, Hebrew-Aramaic and English Lexicon of the Old Testament (#8544), by Francis Brown, S.R. Driver and Charles A. Briggs, 1906; based upon Wilhelm Gesenius, Lexicon Manuale Hebraicum et Chaldaicum, 1833 (included in Biblio.29). This then was the Fall, the ‘original transgression’ of humankind in the remotest past: accepting the misconception called human generation, instead of the reality of divine generation, down across the millenia. ‘Whoever recognizes father and mother, shall be called the son of a harlot’ (Th 105, interlinear). Which confusion Christ came to rectify, by proclaiming that all humankind are in truth Angels born of God and thus Brothers and Sisters, rather than the children of mortal beings. (see Mt 12:46-50/18:10/23:9, Ph 64, interlinear). This same fundamental error is reflected in the common English expression ‘to give birth’—as if the woman were producing the child on her own, instead of receiving it from God. It would be best to use the verb ‘to bear’. ‘To know good and evil is equivalent to deciding on one’s own and with absolute independence what is good and what is evil; that is, to have complete autonomy [from God] in morals’—Santa Biblia Reina-Valera 95, Edición de Estudio, note to Gen 2:9 Biblio.24. The subject matter here is really wonderful. I thank you for your efforts. You should keep it up forever! Best of luck..